(1) The Queen's Colour for the Royal Air Force in the United Kingdom. (3) The standard for individual operational squadrons. All three are made of silk and are similar to the Colours used by the Navy and the Army. The Queen's Colour for the Royal Air Force is in the form of the Royal Air Force Ensign, with the Royal Cypher in gold, ensigned with the Royal Crown in proper colours in the centre. Christopher Southworth prepared a construction sheet based on the illustration by Graham Bartram in BR20. If the flag was introduced in 1947 as we are informed, then the Colour would have contained the Royal Cypher of George VI, ensigned with a Tudor crown of course. This would have changed in 1953, when Her Majesty, Queen Elizabeth II took the throne. The QC's of the RAF and Royal Marines are the only two sets which use the standard 'Admiralty pattern' of Union Flag, whereas those of the Royal Navy and Army each have their own unique variation. 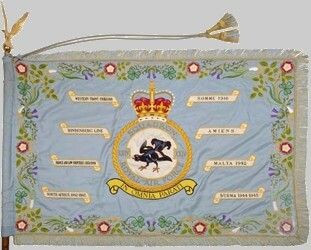 The Queen's Colour presented on 1 April 1968 (the 50th anniversary of the RAF's creation) was that of the RAF in the UK. It replaced a colour presented by King George VI on 16 May 1951. The oldest colour is that for the RAF College, Cranwell, which was the first to be presented, on 6 July 1948. It was replaced 30 May 1975. The idea for RAF colours originated in 1943 (see note below on the significance of 1943), on the 25th anniversary of the service, but because of wartime austerity measures, it was not possible to present any until after the War's end. I don't think it had been intended to deprive the RAF of colours for 25 years, but rather, it was an idea for the 25th anniversary. Of those above, only Halton and Cranwell had a pre-war existence. RAF squadrons have standards. These have to have completed 25 years' service in either the RAF, Royal Auxiliary Air Force (the part-time reserve service), the Royal Flying Corps or Royal Naval Air Service (these last two were the predecessors of the RAF) before a standard can be presented. Alternatively, a squadron can receive a standard for 'outstanding operations'. The regulations appear as Air Ministry Order A866 of 1943. Again, wartime austerity measures prevented their manufacture and presentation until the early 1950s. Thirty squadrons immediately qualified, twenty-eight under the 25 year rule, and two (120 and 617) under the outstanding operations rule. The first standards bore a border of roses, thistles and shamrocks; then someone pointed out there was nothing to represent Wales, so those still at the embroiderers had to have leeks hurriedly embroidered into the borders before they could be presented. Standards are 32 inches on the staff x 48 inches (that's 81cm x 122cm, metric fans :-)). The staff itself is 97 inches (246 cm) with a gilt eagle finial. I have not seen a justification for the 25-year rule. It may be something to do with the fact that many squadrons are disbanded at the end of a war, and so do not have a continuous existence, unlike, say the regiments of the British Army (battalions are disbanded, yes, but rarely whole regiments). 1943 was also the year in which the RAF Ensign was added to the flags on the national war memorial in London. This is a cenotaph in Whitehall, the street leading from Trafalgar Square to Parliament Square. It was unveiled on 11 November 1920 with a Union Jack, White Ensign and Red Ensign on one side, and a Union Jack, White Ensign and Blue Ensign on the other. After the RAF Ensign was instituted in 1921 it was occasionally suggested that it should be added to the flags on the Cenotaph. The idea was always rejected on the grounds that the ensign had not existed during the war, and that the Royal Air Force had not been formed until seven months before the end of the war. In February 1943 Chief of the Air Staff, Air Marshall Sir Charles Portal, obtained the informal agreement of Buckingham Palace, to an Air Council request, that the Royal Air Force should be represented on the Cenotaph by the addition of an RAF Ensign on each side of the monument. This was passed on to the Prime Minister, Winston Churchill, who replied that he did not want any changes. A second attempt to obtain his approval was made by obtaining the agreement of the First Lord of the Admiralty, and the Secretary of State at the War Office, that an RAF Ensign should be substituted for an existing flag. The Prime Minister was still opposed to any change, but abided by a Cabinet decision that the RAF Ensign should replace one of the White Ensigns. The Admiralty asked that there should be no ceremony, and that the substitution should be done unobtrusively by the minimum number of persons. All the flags on the Cenotaph were changed immediately after dawn on 1 April 1943, an RAF Ensign replacing the White Ensign on the west side. At 1130 a Royal Air Force Regiment guard paraded at the Cenotaph and a wreath was placed beneath the RAF Ensign. This standard of Number One Squadron is from Standards Guidons and Colours of the Commonwealth Forces by T.J. Edwards. Description of the badges of the squadrons listed, is listed below. Air Ministry Order 886, 9 September 1943: Institution of RAF Ceremonial Flag. To mark the occasion of the twenty-fifth anniversary of the formation of the RAF the King has signified his intention of awarding a ceremonial flag known as "The Standard" to RAF operational squadrons. The Standard will be awarded, by order of the King in every case, to operational squadrons qualifying in one of the two following respects. (i) By the completion of twenty-five years of existence in the Royal Air Force, Royal Flying Corps or Royal Naval Air Service. (ii) By having earned His Majesty's appreciation of specially outstanding operations. The Standard will consist of a rectangular silk flag with the appropriate squadron badge in the centre on a light blue background, the flag to be fringed and tasseled with scrolls added as requisite for recommended battle honours. The Standard will be carried by means of a staff surmounted by a gold eagle. The Standard will not be made or presented until after the war. It will be consecrated on presentation and instructions will be issued in due course regarding its custody and the ceremonial to be followed when it is carried on parade. The King has approved the award of The Standard to the following squadrons, which had qualified by length of service on 1 April 1943: Numbers 1, 2, 3, 4, 5, 6, 7, 8, 11, 12, 14, 20, 24, 25, 27, 28, 30, 31, 39, 45, 47, 55, 56, 60, 70, 84, 100, 207, 208 and 216. Additions to this list will be announced in the London Gazette and Air Ministry Orders. 1. Winged Number One : In Omnibus Princeps. 2. Carrick Bend (Wake's Knot) superimposed on RAF Roundel : Hereward. 3. Cockatrice : Tertius Primus Erit. 4. Thunder Bolt superimposed on Radiant Sun : In Futurum Videre. 5. Maple Leaf : Frangas Non Electas. 6. Eagle grasping a Snake : Oculi Exercitus. 7. Constellation Ursa Major : Per Diem Per Noctem. 8. Oriental Dagger : Uspiam et Passim. 11. Two Eagles flying : Ociores Acrioresque Aquilis. 12. Fox's Mask : Leads the Field. 14. Winged St George's Circular Shield, surmounted by Helm : (Arabic inscription). 20. Flying Eagle grasping a Sword, superimposed on Rising Sun : Facta Non Verba. 24. Black Grouse Displaying : In Omnia Parati. 25. Hawk, wings spread, on a Glove : Feriens Tego. 27. Elephant : Quam Celerrime Ad Astra. 28. Pegasus rising from behind an Axe and Fascine : Quicquid Agas Age. 30. Palm Tree : Ventre A Terre. 31. Five Pointed Star superimposed on a Garland : In Caelum Indicum Primus. 32. Badge is a golden hunting horn on a blue ribbon and the motto is "Adeste Comites". 39. Winged Bomb : Die Noctuque. 45. Winged Camel : Per Ardua Surgo. 47. Heron's Head superimposed on a Circle of Heraldic Waves : Nili Nomen Roboris Omen. 55. Arm holding Spear : Nil Nos Tremefacit. 56. Phoenix : Quid Si Coelum Ruat. 60. Curly Horned Antelope Head : Per Ardua Ad Aethera Tendo. 70. Winged Lion Couped : Usquam. 84. Scorpion : Scorpiones Pungunt. 100. Scull and Cross Bones : Sarang Tebuan Jangan Dijolok. 207. Winged Lion Standing : Sember Paratus. 216. Eagle grasping a Bomb : CCXVI Dona Ferrens. 120. Hawk standing on North Pole of Couped Globe : Endurance. 617. Thunder Bolts breaching a Dam : Apres Moi Le Deluge. The standards of disbanded squadrons are mostly kept at the RAF College at Cranwell, Sleaford, Lincolnshire NG34 8HB, although a few have been laid up in local churches. In October 1999, 600 Sqn reformed at RAF Northolt from joining and "Re-badging" No 1 and 3 Maritime HQ Units of the RAuxAF. However, the powers that be have refused to reissue a replacement Standard stating that we are not a flying Sqn, nor a Sqn or the RAF Regiment, and so are not "Operational", and secondly, although we hold the 600 Sqn number, we are not the same 600 Sqn as the one awarded the Standard, and so the previous award doesn't count. Our original standard therefore remains laid up in the church of St Bartholomew the Great in the City of London, and we have no hope of a replacement. Although the decision by the Air Council to restrict the issue of standards to 'operational' squadrons was not unanimous when they were introduced in 1943, that became the rule (National Archives AIR 6/74). In 1964, when the RAF Handling Squadron at Boscombe Down applied for a standard (presumably under the 25- year rule), it was rejected on the grounds that standards were only presented to operational squadrons, that is, those engaged with the enemy (AIR 2/16314). So there is a precedent. The question of breaks in service particularly exercised the RAF Regiment in 1964. Many of its squadrons were coming close to qualifying under the 25-year rule, but the Air Ministry deemed that there were breaks in their service when they had been renumbered, once during the Second World War, and again in 1947. At the time, the Ministry claimed that the rule (25 years _with the same squadron number_) was 'inflexibile' (AIR 2/14138). I have found nothing in the documents at Kew to suggest that a squadron once granted a standard was refused permission to continue to carry it, no matter how long the break in service. That was surely the reason why the 25 year rule was dreamed up, so that squadrons should not be disadvantaged by the disbandments following the end of both World Wars. It may be the 'operational rule' that is the one that counts. Why XXIV and not 24 on this flag? Most squadron badges have Arabic numerals, but a significant minority have Roman numerals. Badges were designed by, or at least approved by, unit commanders, and the choice was presumably theirs. More information at http://www.griffon.clara.net/rafh/press1.htm. Other pages on the site have details of standards and illustrations of badges.